It started badly. 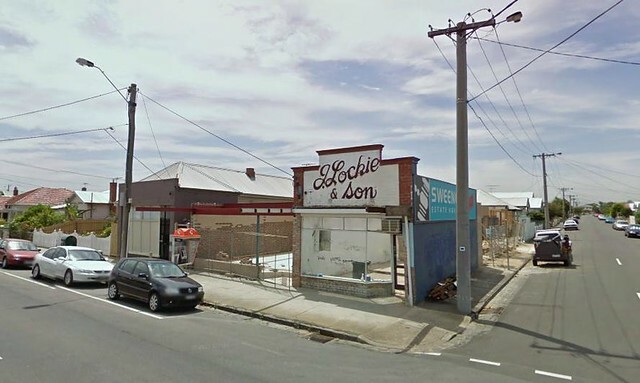 On a backstreet in Footscray, Mr Lockie the butcher used to stand in his smart white coat. Every Christmas he had a wonderful list of Christmas ham orders in his spidery writing on a long sheet of butcher's paper. "Mabel, 1 ham. Doris, 1/2 ham" and on it went, a community ritual it seemed was repeated year after year. Then one day, a sign was stuck to the door reading, "Closing down. X years at this spot. Landlord turning into units". He closed, taking his ruddy cheeks and wonderful concave butcher's block with him. Then the bloody landlord painted over the heritage sign. The forlorn shops stood empty for an age. Slowly, signs of life emerged. A bench. Stools. "Please, please, not another hairdresser," we prayed, as visions of macchiatos danced in our heads. And as if by magic, we have a new community hub for a new era - the wonderful West 48. 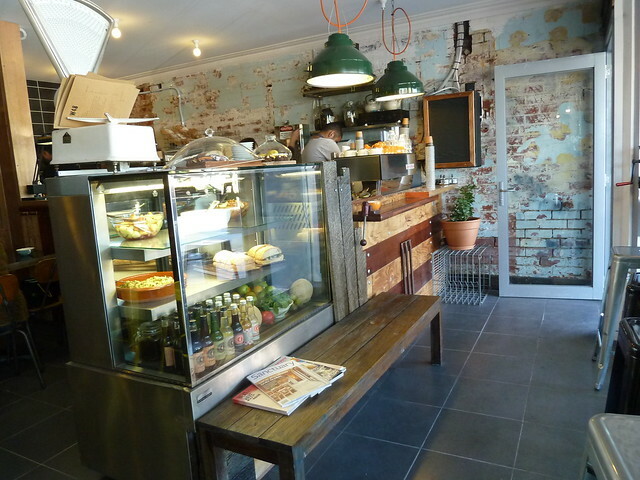 Of course it's not magic - owners Jagdev and Steffan have put a lot of effort into this lovely cafe. There's the de rigeur raw wood, bare bulbs and distressed brick, and I love the happy yellow stools and sunset-orange cups. The menu is quite simple, showcasing seasonal produce - there's no real kitchen, only a small prep area. Think honeyed ricotta, buffalo mozzarella or top-notch Cuca sardines with lots of good bread. 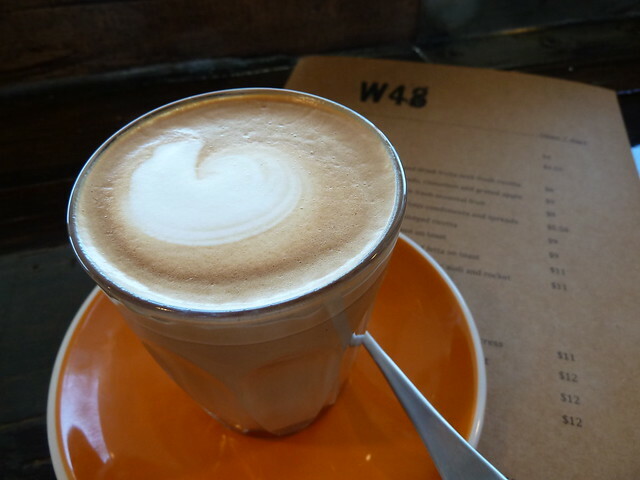 West 48 use Allpress coffee with two separate blends for milk coffee and black. A lovely, lovely latte, silky from neck to knees. Coffees are $3.50 with no extra for soy (@cubbieberry, here's looking at you, kid). 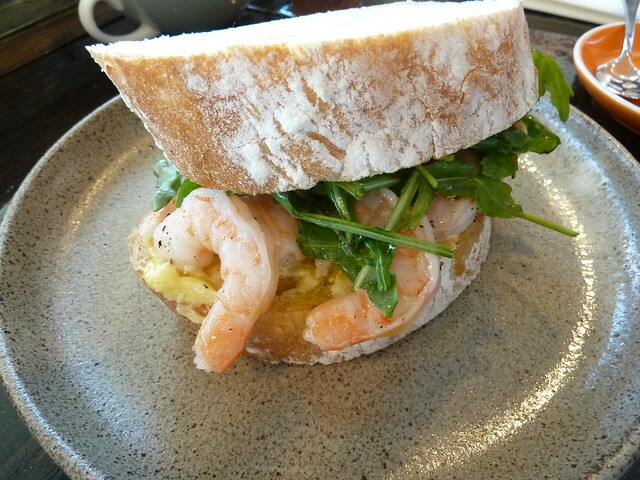 This prawn sandwich ($12), with rocket and golden aioli made with organic eggs, was divine. The prawns burst gently upon biting, their sweet juices mixing with the luscious mayo. Now - I am a food blogger. Out of "necessity", I rarely go to the same place twice (yes, I know, ridiculous #firstworldproblem) and if I do, I even more rarely order the same thing. I went back the very next day and ordered the very same thing. This is like the poor man's Golden Fields lobster roll. The prawns are so fresh and the aioli is utterly unctuous. Today's had watercress instead of rocket, and the piquancy of the greens is just perfect against the rich filling. A perfectly-executed long mac. Gorgeous - like melted 80% cocoa chocolate. In an era of mega malls and chain stores, I relish this new reclamation of the backstreets. Ebi, the Milking Station, Los Latinos and now West 48 are preventing our neighbourhoods turning into nothing but dormitory suburbs packed with units. We need great places we can dawdle to and stagger home from. We need places to run into each other. We may have lost our butcher, but we have two lovely new friends in Jag and Steffan. Viva West 48. Angela, it has happened all of a sudden. Every second post seems to be a new cafe, and there are more to come! Gosh Aimee that's no good at all! I was very happy, three coffees in total and all were great - no sugar required. Attentive service opening day and the next. I hope it was just a one off! That's a shame - I had avocado, fetta and heirloom tomatoes and so did my mum, the only glitch was that they forgot the fetta initially (but brought it out in little bowls when I mentioned it) - but I'm happy to overlook that on day 1! Very friendly service. And should say, the responsibility for Aimee's comment lies ultimately with me because I published it. She's been a long-time reader and I'm sure that genuinely was her experience. I don't think negative comments are something to be avoided because ultimately I think readers are smart and can see all sides - opening weekend, possible one off, different strokes for different folks. I won't publish stuff that's vindictive, nasty or otherwise smells of trolls but ultimately I think everyone's experience is valid. We went twice on Saturday and both times the coffee was fantastic, the avocado on my toast was perfectly ripe. Oh anon, I love that you went twice in one day!! drove past on the weekend and was wondering what it was like - so excited to see your post! Thanks for keeping us up to date on all the latest fab food happenings, have happily voted for you as best blog! Thank you VERY much! I know, I sat in the window and thought so many cars were going to have accidents there was so much neck craning going on. Thank you! It really makes this pocket of Footscray feel like it's got a centre. No one can understand why we're not West Footscray and indeed much of what we do revolves around Barkly Village. Ooh we went there today, lovely meal. I had the prosciutto and egg roll while my brother had the prawn roll...both delicious! Aargh! You beat me to the punch! We went there for lunch on its first day of opening. The guys who run it are lovely and oddly self-effacing! But it lacked the wow factor for me I'm afraid. But I'm not going to knock reasonable coffee within walking distance too much. Well I HAD to after your email saying I was "slipping"!! HUMPH! I've been there twice now and both times food has been delicious - muesli and fruit a winner for breakfast and that prawn roll for lunch is divine! Aioli to die for. Coffee really good and service friendly and efficient. PRAWN ROLL...be still my beating heart. Husband is there getting takeaway coffee now. This is now a dangerous neighbourhood to live in, for all the calorific consequences so many new cafes are having on my jeans! I love how generous they are with the prawns! Coffee looks pretty damn decent too! Yes super generous esp for such good quality! Voted for you of course! Ooh I was wondering how that came - on the menu I think it just says "egg, prosciutto..." but no mention of roll etc. That is definitely next on the list! Prawn roll. I am sold. I wanna live in Footscray. Wah! Are they open late nights? Aww, no nights! (or at least not yet ;-) Weekend? Thanks for continuing to keep us up to date on all the wonderful recent editions for food and coffee in the West. There is hardly enough time on the weekends to get around to the latest additions West 48, Milking Station, Reading Room etc. 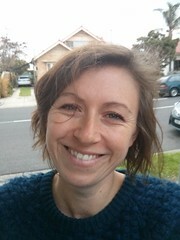 Good luck in the People's Awards - have cast my vote in your favour and tweeted a few of my WeFo buddies to follow suit. Oh, thanks Deb! Gosh, and I have more cafes up my sleeve - they just keep opening! I'm not sure what's happening but I know I like it! Absolutely agree anon. Same goes for as discussed on another post - the question of what if a place sees I'm a blogger and makes me an extra nice one? If they don't keep that up for regular punters, there won't be much repeat custom and indeed, the truth will reveal itself. Great review - went for lunch today and was fairly impressed. The fit-out is amazing and the staff were friendly although waited for prawn ciabatta for 35 minutes - was worth the wait but hopefully wait time was a one-off and they were very busy with staff from hospital. 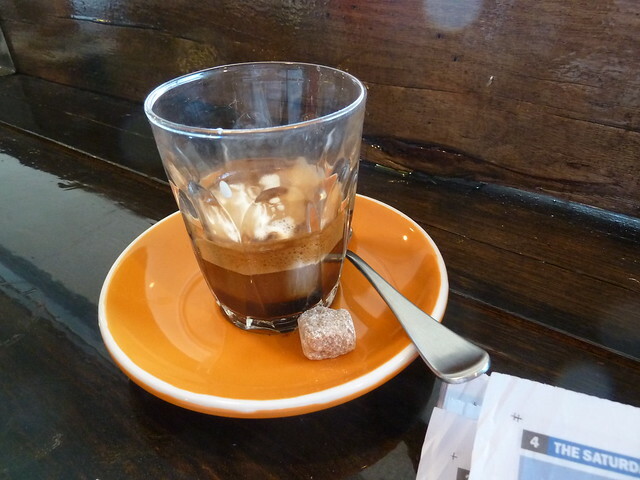 I think this rates as WeFo's best cafe right now - not greatly impressed with Gusto and service can be hit and miss but enjoy Besito. I have being reading your blog for a couple of years now and it is fantastic - you have introduced me to a couple of places I would have never gone to and they are now regular favourites for our family. (sandwich number 9 at La Morenito and the coffee from Cafe Ancetto in Sunshine - unfortunately only open Saturday but I would say best coffee on westside). 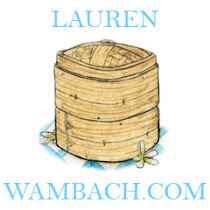 Thanks again for the blog - it's great. Mick, thank you for your lovely comment and I am so glad the blog has helped connect you with new favourites! Thanks so much for stopping by and sharing your experience. It's kind feedback like yours that keeps me going - well, that and the fact I now have a big excuse for my restaurant habit! 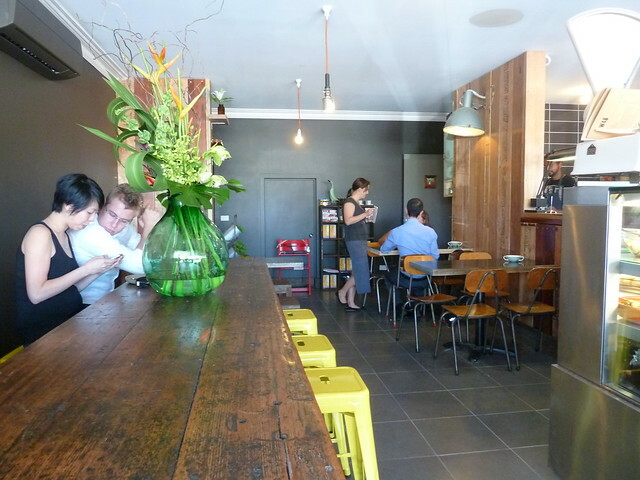 This does look like a lovely cafe but it still makes me sad to see so many shops like butchers and milk bars in Melbourne closing down and being replaced by apartments or cafes. I suppose a cafe is a better option but still I am a little sad to read this. I know what you mean Cara. It's happening all over the western suburbs - pubs being turned into apartments and so on. Footscray Milking Station used to be a milk bar too. Still, better a cafe than nothing, and a good cafe at that! you have adverstised the wrong number as the contact number. this needs urgent attention! Gosh - OK, anon! At your service! It was indeed wrong; I have fixed it. Thank you for bringing it to my attention. 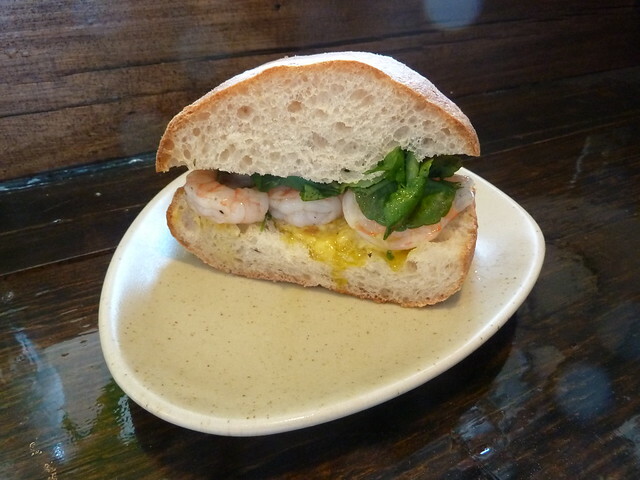 that prawn sarnee looks amazing... might have to try it on the weekend! It's pretty special Jodes! They had a special last weekend which were slices of rosy house-cured salmon on toast with capers and a little red onion. It was divine! Nice generic cafe atmosphere with reasonable quality. BUT very expensive and minimal sized serves. Suitable for yuppies or visitors from South Yarra. Oh Bitter and Twisted, what constitutes a yuppie? I'm honestly not sure what the term means anymore. Look, you're not the first to raise the fact that they think West 48 is too expensive - a number of friends feel the same. Others say you pay for what you get, which is very good (and therefore pricer) produce that needs little tricking up to shine. All the fruit and veg is from Pompelmo in Seddon which is known not for its price but for its quality and the ethics behind it. Eggs are organic and free range, buffalo mozz from La Latteria in Carlton, etc. If you want value, go for the prawn sandwich with amazing aioli versus, say, the prosciutto and egg (both $12) or the new house-cured salmon with scallion cream breakfast plate ($15 from memory, which I think is good value). Or have a soy latte for the same price as cow's milk. Oh it fills up with children way too quickly. Problem with this is? 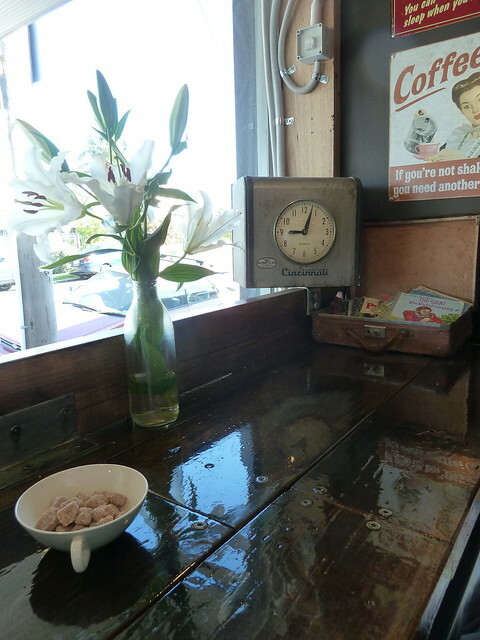 The cafe is small and full of hard surfaces, which means clutter and amplified noise through reverberation. It is small and gets very busy but I still love it. Feels like an extension of my house! Kids in cafes are a good thing. I've spent a long time working in cafes where you see families grow and it's all good. Who cares about a bit of noise and mess. What about the bloke talking loudly on the phone!